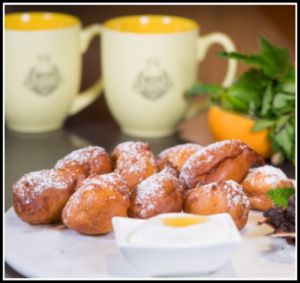 Image of Citrus, Ricotta Donuts taken for the Beer Institute. Recipe was created by Chef Laurent Aubel. In a medium bowl combine all the dry ingredients, slowly stir in beer, ricotta, citrus zest and vanilla bean. Combine mixture until smooth. Let dough rest for 30 minutes. Use an ice cream scoop to proportionately add mixture to the fryer. Cook donuts for approximately 6-8 minutes depending on size. Remove from fryer when donuts are golden brown. In a medium-sized bowl combine heavy cream and powder sugar, whisk until you obtained a nice creamy texture.